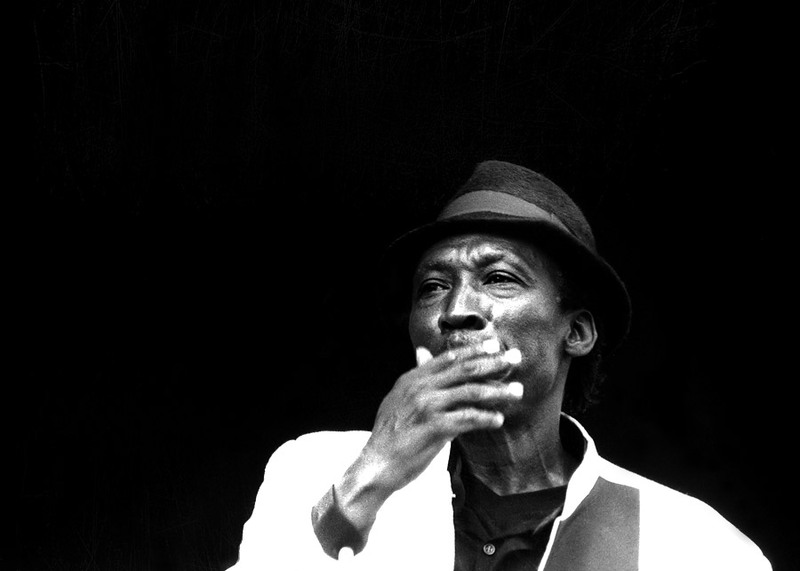 Photo Alton Ellis black and white photo shot by Floyd Celluloyd for Innermann a decade of reggae photography. Please respect the copyright. Do not use the photos without written permission. Alton Nehemiah Ellis, OD, was a Jamaican musician best known as one of the innovators of rocksteady music and was often referred to as the "Godfather of Rocksteady". Ellis was born in 1938 and grew up in Kingston's Trench Town district. Born into a musical family, he learned to play piano at a young age. He attended Ebeneezer and Boys' Town schools, where he excelled in both music and sport. He initially sought fame as a dancer, competing on Vere Johns' Opportunity Hour. After winning a couple of competitions, he switched to singing, starting his career in 1959 as part of the duo Alton & Eddy with Eddy Perkins. Ellis and Perkins recorded for Coxsone Dodd at Studio One, initially in the R&B style, having a massive hit with "Muriel" (from Dodd's first commercially-oriented recording session at Federal studios), a song Ellis had written whilst working as a labourer on a building site and recording follow-ups with "My Heaven", "Lullabye Angel", "I Know It All", "I'm Never Gonna Cry" and "Yours". The duo also recorded a few tracks for Vincent Chin's Randy's label, but came to an end when after winning a major talent contest, Perkins moved to the United States. Ellis remained in Kingston, working as a printer and after losing his job, he restarted his music career, initially forming a new duo with John Holt. When Holt joined The Paragons, Ellis formed a new group, The Flames. Ellis continued to work for Dodd and also recorded for his arch-rival, Duke Reid on his Treasure Isle label. By the mid 1960s, ska was moving on and the beat was slowing down to rocksteady and becoming associated with the violent rude boy subculture in Jamaican dancehalls. Many artists made records referring to the rude boys, including Ellis, although his records were consistently anti-rudie, including "Don't Trouble People", "Dance Crasher", and "Cry Tough", in contrast to artists such as Bob Marley, whom Ellis blamed for glorifiying the rudies. Recording with The Flames (the varying line-up of which included his brother Leslie Ellis, David "Baby G" Gordon and Winston Jarrett), Ellis scored big with the hits "Girl I've Got a Date", "Cry Tough" and "Rock Steady", which was the first song to refer to the name of the newer genre. As rocksteady dominated the Jamaican airwaves for the next two years, Ellis continued to score hits for Treasure Isle, working with artists such as Lloyd Charmers, Phyllis Dillon and The Heptones. His Mr. Soul of Jamaica album is regarded as one of the definitive rocksteady albums. During the late 1960s and early 1970s, Ellis recorded for some of Jamaica's top producers, having two huge hits with Lloyd Daley in "Deliver Us" and "Back to Africa" and recording for Bunny Lee, Keith Hudson, and Herman Chin Loy. Ellis toured the United Kingdom in the 1967 with Ken Boothe and Studio One session band the Soul Vendors and on his return to Jamaica he worked with Dodd, recording the tracks that would be released as his debut album Alton Ellis Sings Rock & Soul. He also began to produce his own records, including "My Time Is The Right Time" and "The Message". Ellis regularly returned to England, working with several London-based producers and after spending a few years in Canada, from 1972 he based himself permanently in the UK. He continued to record and perform regularly, recording in the early 1980s for emerging producers including Henry "Junjo" Lawes, Sugar Minott, and King Jammy. He also opened up the All-Tone record shop in South London, and started a record label of the same name. The "Mad Mad" riddim, first recorded by Ellis in 1967 would later be recycled in more than one hundred other songs. The instantly recognizable three-note descending horn line was reinterpreted by Henry "Junjo" Lawes and eventually became known widely as the "Diseases" reggae riddim. "Diseases" is notably utilized in Yellowman's hit song ""Zungguzungguguzungguzeng", which has in turn has been sampled and reinterpreted by a long list of popular hip hop artists including KRS-One, The Notorious B.I.G., Tupac Shakur and Blackstar. This constant reinterpretation and referencing has made Ellis a major but little-known influence in the trajectory of dancehall, reggae and hip hop. Ellis continued to be active on the reggae scene until his health began to deteriorate. His latest works include performing all over Europe with a French backing-band called ASPO (About Some Precioux Oldies) at the beginning of the 21st century. Recorded in Bordeaux, France, Live with Aspo: Workin' on a Groovy Thing is the only live album Alton Ellis ever published (2001). In 2004, Ellis was awarded the Order of Distinction by the Jamaican government in recognition of his achievements. In December 2007, he was admitted to hospital in London for treatment of cancer of the lymph glands, but he returned to live performance after receiving chemotherapy. Alton was a great man and will always be missed… I’m glad he has children that can sing and keep the legacy going for many years to come.